Africa has one of the biggest populations on the planet, but very few of the billion people living there have any access to the internet or online presence, in fact, it was estimated in 2012 that African users make up only 7% of the internet’s total population. Sensing a possible new market, technology companies such as Microsoft and Facebook are racing to find new ways to connect the world’s second largest continent to the internet, and slowly but surely they may be getting somewhere. 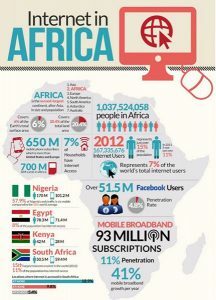 Between 2011 and 2012, the total amount of African internet users went up by 4%, making Africa one of the fastest-growing areas in the world for internet connectivity. Even more impressively, mobile broadband has seen a 41% growth per year, with over 93 million mobile internet subscriptions across the continent. Although this impressive figure actually only adds up to 11% of the total population in Africa, it marks a surge in connectivity which has continued to grow. With connectivity continuing to increase across the African continent, and initiatives such as Project Loon and Internet.org, internet connections in Africa are only set to rise in the coming years. For more information on the impressive statistics, check out the full infographic by Mushroom Networks.